Both crop prices and wages have seen significant deceleration in the last five years. The current crisis in rural incomes — despite lot of “asset” creation, whether through building of roads, houses and toilets or providing electricity, LPG, banking and broadband access, in the last five years — has been largely attributed to low crop prices. This is borne out by official wholesale price index (WPI) data, based on which annual inflation has averaged 3.10 per cent for “food articles” and 0.67 per cent for “non-food” agricultural articles (fibres, oilseeds, fodder, hides and skins, tobacco, natural rubber, flowers, etc.) during the last five years (2014-2018). Given that the average yearly increase in the consumer price index (CPI) for rural India has been 5 per cent during this period, it means crop prices have actually fallen in real terms for farmers, who mostly sell their produce wholesale and buy everything retail. Chart 1 shows the average annual WPI inflation in both food and non-food agricultural articles from 2004 to 2018, covering three five-year-periods — 2004-2008, 2009-2013 and 2014-2018 — roughly coinciding with the previous Congress-led United Progressive Alliance’s first (UPA-1), second term (UPA-2) and the present National Democratic Alliance (NDA) government under Narendra Modi, respectively. 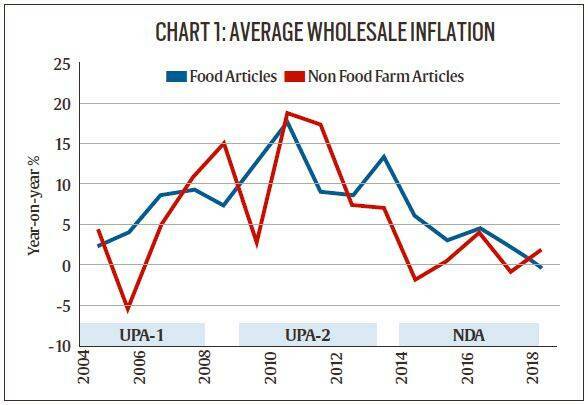 It emerges that wholesale inflation was the highest during UPA-2, averaging 12.27 per cent per year for food and 10.71 per cent for non-food articles. The WPI for food and non-food articles also rose under UPA-1, by 6.27 per cent and 5.87 per cent annually on an average — much more than under Modi’s NDA. With the average annual CPI inflation for rural labourers at 10.87 per cent and 5.89 per cent during 2009-2013 and 2004-2008, respectively, farmers experienced a real increase in prices, at least for food crops. But farmers apart, there are also rural folk owning little or no land and deriving income by working as agricultural as well as non-agricultural labourers. How have they fared during these three distinct periods? Chart 2 shows the annual growth in average daily wage rates in rural India for men over the last 15 years, both in nominal and real terms after netting out CPI inflation for rural labourers. Here, the trend is quite interesting. During UPA-2, rural wages went up by 17.71 per cent on an average every year. Even after factoring in inflation of 10.87 per cent, the average real growth worked out to 6.83 per cent. This was way above the current NDA period, which has witnessed an average annual nominal rural wage growth of 4.83 per cent and a mere 0.86 per cent in real terms. What is significant, though, is wage growth during UPA-1, which, at 5.55 per cent per year, was lower than the average inflation of 5.89 per cent. In other words, there was a fall in real rural wages during UPA-1, which got substantially reversed in its second innings. So, what’s the big picture that comes out? 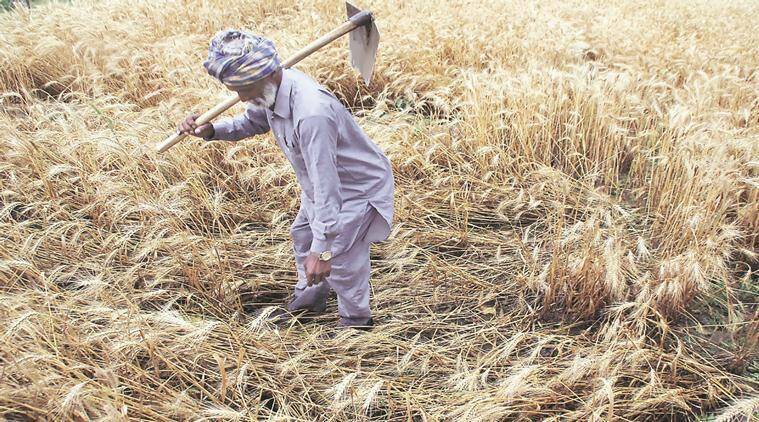 During the UPA period, farmers benefitted from rising crop realisations, partly driven by the global commodity boom that also coincidentally began around 2004. 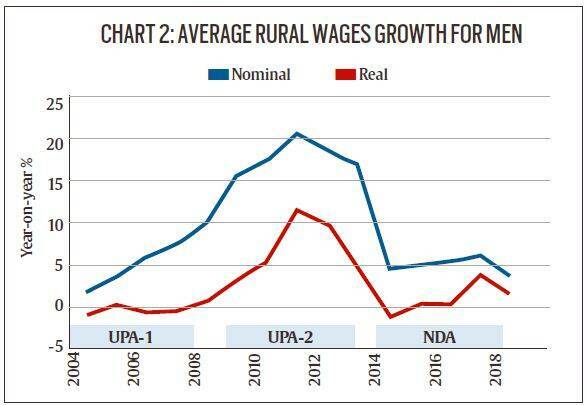 Those gains trickled down to rural labourers in the form of higher wage growth, especially during UPA-2. This was further enabled by overall economic growth and opening up of new employment avenues outside of agriculture. As jobs in sectors such as construction and manufacturing got created, alongside increased migration opportunities, the end-result was a general tightening of rural labour markets. All these have gone into reverse in the last five years. The international agri-commodity prices boom collapsed in 2014, again coincidentally roughly after the Modi government came to power. Domestic crop prices were dealt an added blow by the adoption of a formal inflation-targeting monetary policy regime in February 2015, followed by demonetisation in November 2016. With the broader economy, too, slowing down, the effects have percolated down to rural wages, where it is not only agricultural labourers who have borne the brunt. Even for skilled workers in rural India — carpenters, blacksmiths, masons, plumbers, electricians and drivers — the average year-on-year rise in wages during 2013-2018 has been just over 5 per cent in nominal terms. Are there any electoral implications from all this? Well, not really, going by the high real growth in both crop prices and rural wages during UPA-2. That did not prove particularly useful in the 2014 Lok Sabha polls.